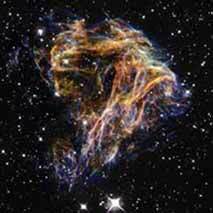 Type II supernova explosions provide solid proof of many of the contentions that I have raised throughout my work. Supernovas are “neutronic”/magnetic stars that comprise the magnetic part of a wave formation. While a comprehensive explanation of supernova explosions can fill an entire library, I will limit this discussion to the facets which pertain to wave theory. The size of a particular energetic wave formation depends on its energetic loop. Since the supernova is actually a magnetic loop, its size before the explosion is rather small. Its disintegration generates radiation that is emitted in extremely short waves. The particles that it expels are also endowed with the properties of neutrons, and we thus refer to them as neutrinos (see adjacent picture). Neutrinos are characterized by small energetic loops (space), narrow wave bands, and extremely high rates of rotation (in contrast to formations with large energetic loops that rotate at a slower pace and have broader bands). The gravitational-magnetic loop comprises the majority of the residue of an energetic loop that has lost its energetic loop. Consequently, it is essentially rendered a neutron that has a substantial gravitational impact on a limited condensed area. In fact, energy is constantly escaping from neutrons in various ways. These formations of energetic matter align into condensed areas of the particular star, and ultimately precipitate an explosion that results in the collapse of part of the star. However, this explosion — similar to the startup fuel of an atomic bomb — merely sets the stage for a second, emphatic blast in which the entire star disintegrates into a sparkling array of energetic matter (quarks) and other energetic formations. Following the second, colossal explosion, the star’s scattered energy/quarks begin to create a new formation, which constitutes the nascent stages of a new life cycle (see pictures below). In other words, the released energy produces a new wave formation that aligns into a classic, two-loop formation, and the latter's’ black hole potentiates energetic circulation of the new entity.